Electrons can be a persuasive bunch, or at least, a talkative bunch, according to new work from John Berry’s lab at the University of Wisconsin–Madison. The spins of unpaired electrons are the root of permanent magnetism, and after 10 years of design and re-design, Berry’s lab has made a molecule that gains magnetic strength through an unusual way of controlling those spins. Berry says the new structure that graduate student Jill Chipman created could lead to a breakthrough in quantam computing, an approach with such great potential that it could undermine today’s silicon-based supercomputers much as the telephone did the telegraph: A great leap forward that begins a slide into irrelevance. The presence and activity, or “spin,” of unpaired electrons sets the strength of a permanent magnet, so molecules with a high degree of spin are a desirable target for chemists. The unusually large spin in the new magnetic molecule, Berry explains, results from a “messenger electron” that shuttles between an unpaired electron at each end of the rod-shaped molecule and persuades all three of them to adopt the same spin. That agreement of spin, “orthogonality” in the jargon, adds strength to a permanent magnet. Berry, a UW–Madison professor of chemistry, notes that in other materials, a traveling electron tends to oppose the spins of magnetic centers, reducing the magnetic strength. In Chipman’s new creation, however, the messenger electron is focused on harmony: like a traveling social worker, it causes the two remote unpaired electrons to take the same spin, adding strength and/or durability. The new molecule, described in Chemistry – A European Journal, contains carbon, nickel, chlorine, nitrogen, and molybdenum, but lacks the costly rare earth elements that have bedeviled efforts to commercialize super-strong new magnets. Its structure suggests that the molecule could be formed into a polymer – a repeating chain of units like those found in plastics – raising the possibility of cheaper, stronger magnets. 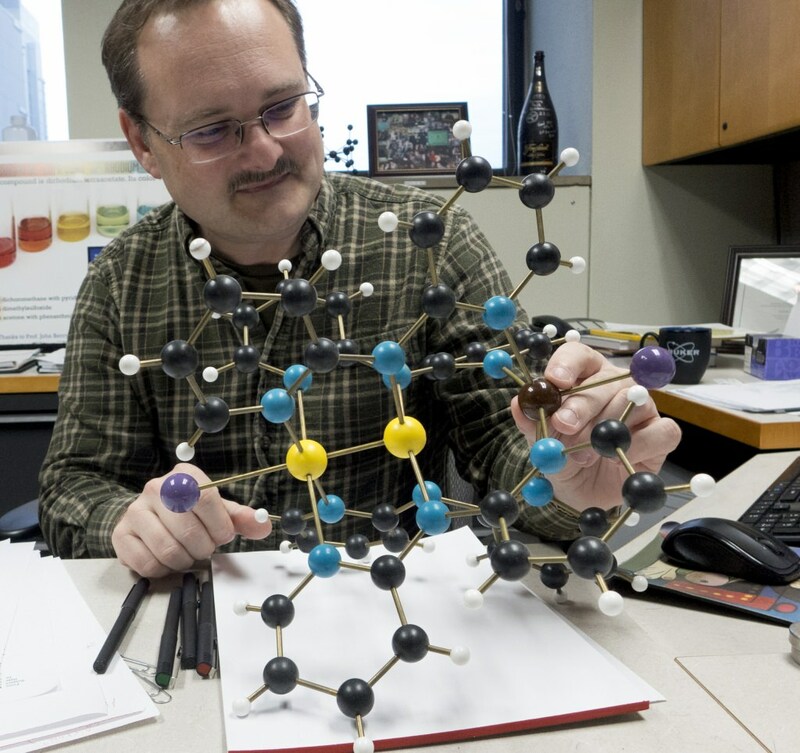 The “traveling social worker” electron establishes “a design principle that could be used to create many new magnetic molecules that behave as little bar magnets,” Berry says. The discovery was also enabled by the arrival last summer an instrument called a SQUID magnetometer (Superconducting QUantam Interference Device) that can measure magnetism with great accuracy down to below 2 degrees above absolute zero. By going the next step, and miniaturizing magnets to a single molecule, that could enable quantam computing, Berry says. Quantam computing could be especially beneficial to chemists, who confront staggering complexity in trying to model the chemical reactions that are their bread and butter. This work was supported in part by the National Science Foundation (CHE-1669994). Computational facilities were supported by the NSF under Grant CHE-0840494. The Bruker Impact™ II mass spectrometer was funded via a bequest from Paul J. and Margaret M. Bender.